This book undoes 50 years of mythmaking about Stravinsky's life in music. During his spectacular career, Igor Stravinsky underplayed his Russian past in favor of a European cosmopolitanism. Richard Taruskin has refused to take the composer at his word. In this long-awaited study, he defines Stravinsky's relationship to the musical and artistic traditions of his native land and gives us a dramatically new picture of one of the major figures in the history of music. Taruskin draws directly on newly accessible archives and on a wealth of Russian documents. In Volume One, he sets the historical scene: the St. Petersburg musical press, the arts journals, and the writings of anthropologists, folklorists, philosophers, and poets. Volume Two addresses the masterpieces of Stravinsky's early maturity—Petrushka, The Rite of Spring, and Les Noces. Taruskin investigates the composer's collaborations with Diaghilev to illuminate the relationship between folklore and modernity. He elucidates the Silver Age ideal of "neonationalism"—the professional appropriation of motifs and style characteristics from folk art—and how Stravinsky realized this ideal in his music. Taruskin demonstrates how Stravinsky achieved his modernist technique by combining what was most characteristically Russian in his musical training with stylistic elements abstracted from Russian folklore. The stylistic synthesis thus achieved formed Stravinsky as a composer for life, whatever the aesthetic allegiances he later professed. 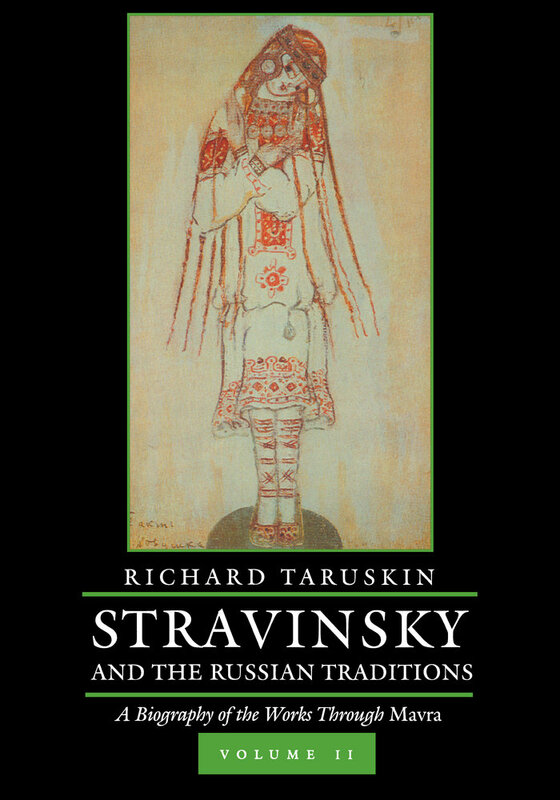 Written with Taruskin's characteristic mixture of in-depth research and stylistic verve, this book will be mandatory reading for all those seriously interested in the life and work of Stravinsky. Richard Taruskin is the Class of 1955 Professor of Music emeritus at the University of California, Berkeley, where he taught from 1987 to 2014, after twenty-six years at Columbia University (man and boy). He is the author of Stravinsky and the Russian Traditions, On Russian Music, Defining Russia Musically, and the six-volume Oxford History of Western Music.